I’m easily amazed. Others who know me might suggest that I’m ridiculously gullible (my beloved comes to mind). When I was little, I would watch my dad pull grapes from my friends’ ears, I believed in Tinkerbell with unshakeable conviction and I knew with certainty that when I went to sleep each night, my toys came to life and had a party. As I write this, I’m not exactly sure that the last sentence should be written in the past tense. I’ve not changed much. I don’t define magic as the mastery of optical illusion, the sleight of hand that can be explained by a slo-mo instant replay. 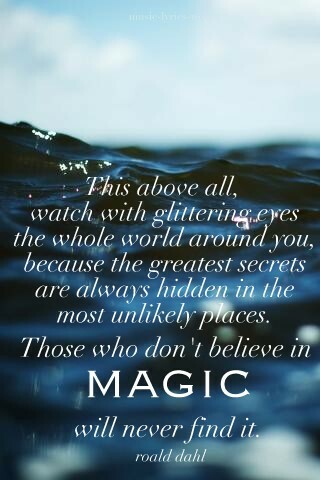 Magic is bigger than that. Magic belongs up there with miracles, faith, love…Magic is what allows you to see two cardinals playing tag even though your heart is breaking. Magic is the sound of a baby’s belly laugh. Magic is in music that can lift you up and carry you to places you didn’t even know you could create. There’s magic in the silence of the early hours of morning. Like no other silence, it is protective and intimate and comforting. Though I’m no magician, there is a spell that has been woven between us that draws me to this connection time and time again. I can’t explain how these friendships have formed, why these conversations are often more enriching than those that occur in face-to-face dialogue. I leave it to magic – for magic allows for that which should remain inexplicable, fantastic. How do I define the child that dances in my soul and escapes so I can play air guitar in the kitchen (I am really good at this by the way), use my brush as a microphone and turn my bathroom into a concert venue? Magic. Because Dahl was right – there is truly something magical to be felt in each moment that is heeded. Each connection holds a bit of wonder that defies logic. So, today I hope you suspend logic for a little while. Catch a ray of sunshine and hold it close for minute. Feel the magic.